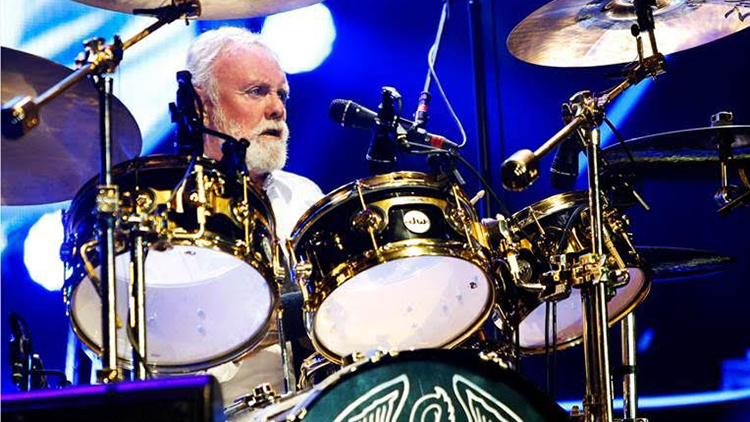 When we speak to legendary Queen drummer Roger Taylor ahead of his Asia tour with Brian May and Adam Lambert - a tour that will include his first ever show in China - he tells us he's just got back from 'a bit of yachting' and is preparing to go on holiday again before the tour starts. 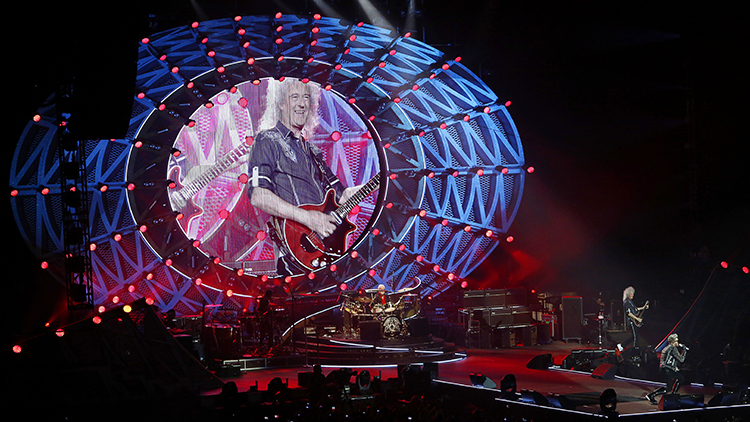 The writer of hits such as 'Radio Ga Ga', 'Under Pressure' and 'These Are the Days of Our Lives' delivers this information with a knowing chuckle and is relaxed and in good spirits as we discuss the prospect of a new Queen studio album, taking to the stage with his son Rufus and, first, what it's like being back on the road again. Yeah we had a sensational tour in Europe. We did I think 15 shows in 15 different countries and it was fabulous actually, apart from two very rainy ones. It's great, with Adam Lambert we've kind of found a new lease of life. He's a perfect fit for us, an incredibly gifted singer and performer - it's a lot of fun. Well no, he does bring himself, but he has a lot of things in common with Freddie Mercury. He has an incredible sense of humour, which is very important, and he has an incredible vocal range - and those two things really make him perfectly fitted for Queen. It's a delight really for us. Rather unexpected - Brian and I didn't expect to still be working under the name Queen - but this is our fourth or fifth tour [with Adam Lambert] now and we've found ourselves absolutely loving it. Actually it was the guy who plays keyboards with us emailed me from America saying 'boy oh boy, you've got to see this guy on Idol called Adam Lambert'. I think he was singing 'A Whole Lotta Love' by Zeppelin and I thought 'wow'. And then by sheer coincidence we were asked to do the final of Idol that year and we went over and Adam sang with us 'We Are the Champions' and we were bowled over by the voice, and also he had this kind of Elvis-y look about him, which is why I call him Camp Elvis... is that a place or is it a person? It seems to work... but it's interesting being on tour with him. And of course we've never played - well I have never played and Brian has never played - in China, so this is a real first for us. And there can't be that many of those kind of landmarks left for you to achieve in your careers now. Does that make a show like this a bit special for you? Well it does, indeed it does. I just don't know what to expect. I've heard lots of things about Shanghai and it looks like an incredibly modern, huge, impressive city, but other than that I have very little knowledge about it. We'll probably get one or two days off so I'm basically going to go and see the main sites. Adam's been here a few times now. Has he told you much about it? Yes, he says it's great. He says 'I love China'; he's obviously had good times there. And it certainly looks incredible. Do you have much of a pre-tour regime these days when you're preparing for shows like this? Well we always rehearse and a lot of it's in the mind I think, but the rehearsals get you physically up there. And then just before an actual show we sing together just before we go on to get our harmonies together and stretch our vocal chords. Y'know Adam does a few exercises. But before that it goes very very quiet for about two hours. I think everybody just likes to be quiet and focused and martial their energies. How easy is it to motivate yourself to go out on tour after all these years? Oh I absolutely look forward to it every time. It's exciting. We have a very exciting act I think that people seem to love, so I feel very confident in that and quite proud to still be doing it actually. And now you also have your son Rufus on stage with you doing percussion and drums. How is it having him join for these shows? He's phenomenal. The rest of his life he's in The Darkness - the band that is - and it's fantastic having him, he's incredibly powerful and he keeps me on his toes. It's brilliant, he brings a real spark and an edge. And people can see that once, I must've been better looking y'know - he's like a younger, stronger more flexible version. The two of you have a drum battle now in the middle of the set. Is that a nod to a friendly father-son rivalry? It's more of a mutual sort of benefit thing in a way rather than a rivalry - although it's presented as a rivalry. It's actually a way to gee each other up a bit and it seems to go down very well actually; I was a bit dubious about it when we first started doing it, but it's actually a nice piece of humanity there in the middle of the show. When he first started getting into music was it something you actively encouraged or did you have any misgivings about it? I did actively encourage it. Well, yeah, it looked like he wasn't going to be a nuclear physicist, but he really wanted to do that and his whole life turned I think when I took him to the Reading Festival one year and he was into the drummers and I said 'no, no, you wait until you've seen my buddy, he's better than that guy'. And the bands were all very good that year, but eventually he saw the Foo Fighters and they came on and that changed his whole life. He actually plays more like Taylor Hawkins than me. Taylor got him up to sit right behind him for the show and then he based his whole technique on Taylor, so it's quite different. In the beginning I gave him a bit of advice, but he kind of went off on his own. We still exchange information at times - y'know, like it's not necessary to be the loudest drummer in the world all the time - but that really turned his life around - it was one of those epiphanies, one of those days in one's life. Does he write like you at all? Yeah he's writing now with The Darkness - they're all writing their new album - so he's really trying to immerse himself in the writing process, which is ultimately probably the most interesting end of things. Are you personally still writing regularly? I just wait for something to come along. I probably write, I don't know, probably three or four songs a year I think. I'm not Paul McCartney who wakes up every day with a new song. But I just write about something that might mean something to me, something that comes. Is that a process that's gotten harder or easier over the years? Well I think if you just let it come naturally - you don't try and force anything out - I think it tends to be better. I wouldn't say it ever comes easily, but just occasionally it comes naturally, and they tend to be the better things. Does it get harder to recognise those better things or to continually feel that you've come up with something new? I think at the end of it, only you can be the judge. And at our stage in our career, which is obviously very late, we wouldn't expect to make a contemporary album now, because frankly I don't think we'd know how to. It's also a matter of expectation - people might expect something that they might not expect from a very contemporary band, so it's kind of doubly impossible. You couldn't make it avant-garde enough... it just wouldn't fit because it wouldn't be us, so it's very difficult. I think you just have to do things on your own terms. Does that also make it hard to consider recording a new Queen album then? There's regularly talk about whether you'll go into the studio with Adam. No, I think that we should actually, I don't know why we haven't got around to it. Of course Adam does have a fairly busy career on his own, but I think we should, but I don't think people should expect radically ground-breaking things, but I think we could make some very brilliant music with Adam and we should do. No concrete plans, but I think we're just a bit too lazy really. I really can't answer that because every tour we do, we suddenly think 'oh, we've been offered this tour of whatever and wherever - shall we do it?' and everything is like a surprise. We don't have plans to keep going, but we don't have plans to absolutely stop. I imagine there's only a certain length of time really; I mean, we're all getting on a bit - well Brian and I are - but we still play to a very high level. As long as we can do that, we'll keep going. You know, we don't do it all the time really, sort of very occasionally - although more occasionally than we have been lately. Do your set lists write themselves these days or is it hard for you to go back through everything and put one together? It really is and it will change according to the country or the continent that we're playing in, knowing that certain songs were particularly popular or certain songs that were big somewhere else weren't so big there, so no we do change and vary our content. And how does playing somewhere for the very first time influence those decisions? Well I guess we would look at what we would've thought would've been the most international songs that people would maybe know... I don't know, it'll be very interesting actually to see the reaction. I don't know how people react over there in concerts like ours. But we always worry, we're always concerned. Yeah I think so. If you're not bothered it's slightly unnatural. You should be bothered. But we very much look forward to coming to Shanghai and I hope everybody there has a great time.